حمیدی, حجت الله, چاوشی, امیر. (1396). سامانه اشتراک دوچرخه تهران: ارائه رویکردی مناسب جهت ایجاد جایگاه های اشتراک دوچرخه هوشمند. فصلنامه علمی - پژوهشی مهندسی حمل و نقل, 9(2), 258-276. حجت الله حمیدی; امیر چاوشی. "سامانه اشتراک دوچرخه تهران: ارائه رویکردی مناسب جهت ایجاد جایگاه های اشتراک دوچرخه هوشمند". فصلنامه علمی - پژوهشی مهندسی حمل و نقل, 9, 2, 1396, 258-276. حمیدی, حجت الله, چاوشی, امیر. (1396). 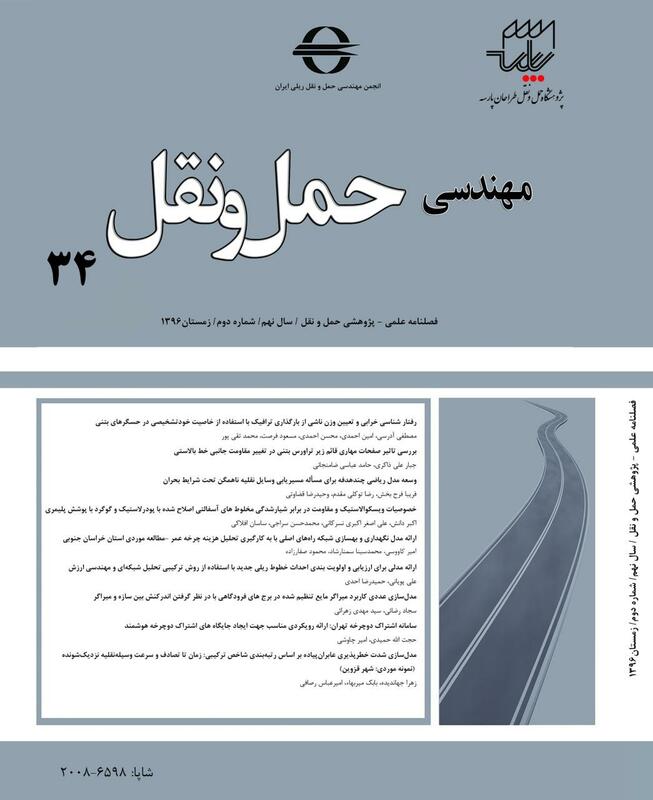 'سامانه اشتراک دوچرخه تهران: ارائه رویکردی مناسب جهت ایجاد جایگاه های اشتراک دوچرخه هوشمند', فصلنامه علمی - پژوهشی مهندسی حمل و نقل, 9(2), pp. 258-276. حمیدی, حجت الله, چاوشی, امیر. سامانه اشتراک دوچرخه تهران: ارائه رویکردی مناسب جهت ایجاد جایگاه های اشتراک دوچرخه هوشمند. فصلنامه علمی - پژوهشی مهندسی حمل و نقل, 1396; 9(2): 258-276. امروزه توزیع دوچرخه به یکی از مقوله‌های رو به ‌رشدو قابل‌توجه در حوزه­ حمل‌ونقل، در بیش از 800 شهر جهان تبدیل شده است.بسیاری از تحلیل­گران پیش‌بینی کرده‌اند که آمار صدمات پس از استفاده و اجرای سامانه‌ توزیع دوچرخه روند افزایشی خواهد داشت، ولی پژوهش‌های تجربی در این حوزه نشان می‌دهد که درصورت اجرای درست این سامانه، روند افزایشی مجروحیت‌ها و صدمات ناشی از استفاده از سامانه‌ توزیع دوچرخه کاهش خواهد یافت. در این مقاله، به‌وسیله تجزیه‌و‌تحلیل داده­ها و اطلاعات شهرداری تهران، به تحلیل روند تراکنش‌های جایگاه­های اشتراک دوچرخه­ تهران و مزایا و معایب آن خواهیم پرداخت و همچنین موضوع عدم‌استقبال مردم از برخی ایستگاه­ها را بررسی نموده و سپس داده­های به‌دست‌آمده از سامانه‌ توزیع دوچرخه­ شهر تهران را با دو شهر پاریس و لندن که سابقه‌ بیشتری در حوزه راه‌اندازی سامانه توزیع دوچرخه دارند، مقایسه می­نماییم.همچنین پیشنهاداتی نیز برای شهرداری تهران در رابطه با استفاده از دوچرخه­های الکتریکی و لزوم استفاده از سامانه مکان‌یابی جهانی (GPS) به‌منظور دست‌یابی به آمار دقیق تعداد سفرها، مکان‌یابی دقیق کاربران و میزان مصدومیت­ها و آسیب­ها ارائه‌شده است. علاوه‌براین، رویکردی برای استفاده‌ بهینه از مسیرهای ویژه عبورومرور دوچرخه ارائه می­شود. -Allen, D. P., Rouphail, N., Hummer, J. E. and Milazzo, J. S. (1998) “Operational analysis of uninterrupted bicycle facilities”. Transportation Research Record, No. 1636, pp. 29–36. -Bernstein, L. (2014) “Proportion of head injuries rises in cities with bike share programs”, Washington Post (Retrieved from http://www.washingtonpost.com/news/to-your- health/wp/2014/06/12/cities-with-bike-share-programs-see-rise-in-cyclist-head- injuries/). -Bhatia, R. and Wier, M. (2011) “Safety in numbers” re-examined: Can we make valid or practical inferences from available evidence? Accident Analysis and Prevention, Vol. 43, No.1, pp.235–240. -Dept. Transport (2013)”Reported road casualties Great Britain: 2012”, London: National Statistics (Retrieved from www.gov.uk/government/uploads/system/uploads/ attachment data/ﬁle/269601/rrcgb-2012-complete.pdf). -Elvik, R. (2009) “The non-linearity of risk and the promotion of environmentally sustainable transport”, Accident Analysis and Prevention, Vol. 41, No.4, pp.849–855. -Elvik, R. (2011) “Publication bias and time-trend bias in meta-analysis of bicycle helmet efﬁcacy: A re-analysis of Attewell, Glase and McFadden, 2001”, Accident Analysis and Prevention, Vol. 43, No. 3, pp.1245–1251. -Elvik, R. and Bjørnskau, T. (2015) “Safety-in-numbers: A systematic review and meta- analysis of evidence”, Safety Science, http://dx.doi.org/10.1016/j.ssci.2015.07.017. -Fischer, C. M., Sanchez, C. E., Pittman, M., Milzman, D., Volz, K. A., Huang, H. and Sanchez, L. D. (2012) “Prevalence of bicycle helmet use by users of public bike share programs”, Annals of Emergency Medicine”, Vol. 60, No.2, pp.228–231. -Fishman, E. (2015) “Bikeshare: A review of recent literature”, Transport Reviews”, http://dx. doi.org/10.1080/01441647.2015.1033036. -Fishman, E., Washington, S. and Haworth, N. (2012) “Barriers and facilitators to public bicycle scheme use: A qualitative approach”, Transportation Research Part F, Vol. 15, No. 6, pp. 686–698. -Fishman, E., Washington, S., and Haworth, N. (2013) “Bike share: A synthesis of the literature”. Transport Reviews, Vol. 33, No. 2, and pp.148–165. -Fishman, E., Washington, S. and Haworth, N. (2014) “Bike share's impact on car use: Evidence from the United States, Great Britain, and Australia”, Transportation Research Part D, Vol.31, No. 7, pp.13–20. -Flegenheimer, M. (2013) “No riders killed in ﬁrst 5 months of New York City bike-share program”, New York Times (from http://www.nytimes.com/2013/11/05/nyregion/no- riders-killed-in-ﬁrst-5-months-of-new-york-city-bike-share-program.html? _r=0). -Goodman, A., Green, J. and Woodcock, J. (2013) “The role of bicycle sharing systems in normalising the image of cycling: An observational study of London cyclists”, Journal of Transport Health, Vol.1, No.1, pp.5–8. -Graves, J. M., Pless, B., Moore, L., Nathens, A. B., Hunte, G. and Rivara, F. P. (2014) “Public bicycle share programs and head injuries”. American Journal of Public Health, Vol.104, No. 8. pp. e1–e6. -Haworth, N., Schramm, A., King, M., and Steinhardt, D. (2010) “Bicycle helmet research”.Queensland: Centre for Accident Research and Road Safety. -Hu, F., Lv, D., Zhu, J., and Fang, J. (2014) “Related risk factors for injury severity of E-bike and bicycle crashes in Hefei”, Trafﬁc Injury Prevention, Vol.15, No.3, pp.319–323. -Jacobsen, P. L. (2003) “Safety in numbers: More walkers and bicyclists, safer walking and bicycling”. Injury Prevention, Vol. 9, No.3, pp. 205–209. -Jacobsen, P. L., and Rutter, H. (2012). “Cycling safety” In J. Pucher, and R. Buehler (Eds.) City cycling (pp. 141–156). Cambridge, Massachusetts: MIT Press. -Jensen, P., Rouquier, J. B., Ovtracht, N., and Robardet, C. (2010) “Characterizing the speed and paths of shared bicycle use in Lyon”. Transportation Research Part D, Vol. 15, No.8, pp.522–524.